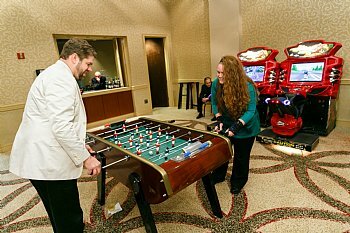 Foosball Table-Bonzini Foosball Table rental for corporate events, trade shows & parties. The Bonzini Foosbal table rental is a European foosball table manufactured in France. The individual players on the Bonzini Foosball Table Rental are handcrafted and when you are playing, the players appear so realistic. 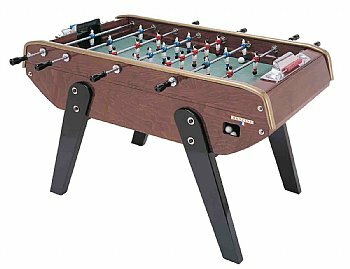 The figurines on the Bonzini Foosball Table Rental are individually hand painted and are metal which are very strong & durable. 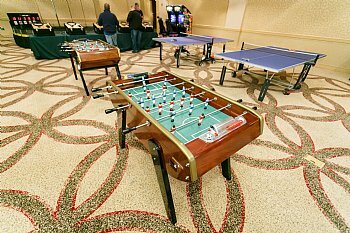 As a trade show booth game, this professional foosball table will certainly draw a crowd with its elegant design. For those corporate events or branding activations that want to customize the foosball table, we recommend customizing the sides of the Bonzini foosball table only. Contact one of our event specialists at 800 WOW-1196 to discuss the branding & customization options available.